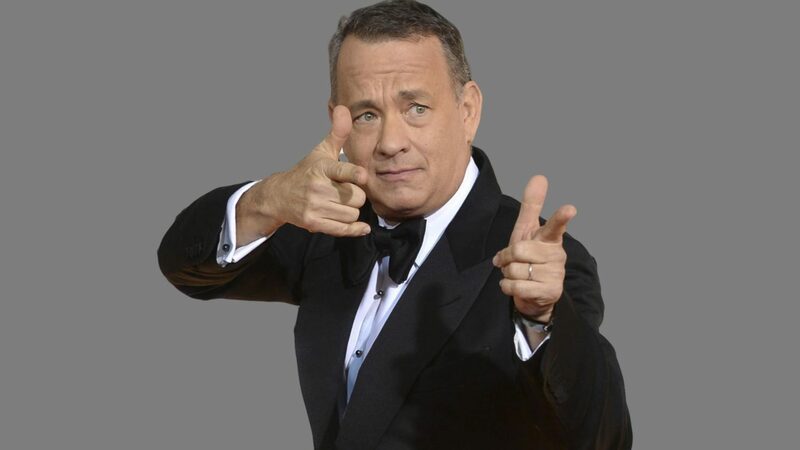 I would say that Tom Hanks is my favourite actor. He is brilliant in every film he is in and is also a lovely person in real-life too (which tends to help). I have yet to see a film that he is in that I have not liked, with many of the films he is in being classics. This week I decided to re-watch one of his films each evening, choosing four very different films which are arguably not considered classics (well maybe one of them is). I thought about re-watching Forrest Gump (one of my favourite films) but then thought I have seen that a LOT. I haven't got Castaway or Saving Private Ryan on DVD (which to be honest tends to bore me a bit) and saw the brilliant The Green Mile very recently. So...Monday nights film is...Sully (2016). I loved Sully when I first saw it. Initially drawn to it when I discovered the plot, which consisted of retelling the landing of the US airways Flight 1549 on the Hudson river in New York on the 15th of January 2009. Even though the real event was enormously publicised, as I was quite young I don't particularly remember the event. I did however already know that the heroic Captain Chesley Sullenberger was heavily criticised for the landing, with people claiming he carelessly risked the lives of the passengers. Dramatised in the film, it shows the struggle he and his First Officer went through, and how their actions saved the lives of all on board and without their brilliant quick-thinking measures, it would have been fatal. What I love about the film, is that it showed different sides to the event, with a powerful and raw performance by Hanks and an equally excellent portrayal of First Officer Jeff Skiles by Aaron Eckhart. Portraying the dramatic landing and repercussions, as well as what some of the passengers did before the flight. Thankfully all of the passengers and crew survived, but the film is still incredibly moving and emotional, brilliantly directed by Clint Eastwood. It perfectly shows the brilliance of the air crew and how Captain Sullenberger's and Jeff Skiles actions were courageous and how they took a risk that many others wouldnt', saving all their lives. Other actors performances throughout the film are also notable, such as Laura Linney's Lorraine Sullenberger as well as the other supporting cast who give first-class performances which made me forget I was watching a re-telling of an event and not a documentary on it. It wasn't Hollywood-ised or cheesy. I would recommend this to everyone, it is dramatic yet comedic at times and is full of heart. A fabulous cast, has an Interesting and captivating topic and is wonderfully filmed. I would rate it 4/5 *'s. Featuring the powerhouses of Tom Hanks and Meg Ryan, 1998's You've Got Mail is the ultimate romantic comedy. Directed by the hugely talented Nora Ephron (who wrote Sleepless in Seattle and my favourite film When Harry Met Sally), it is funny, romantic and unique. Yes, it is a love story, but the characters are relatable and wholesome. Hanks and Ryan are business rivals. Both in the book industry, one with a multimillion dollar chain and the other with a small children's bookshop in the heart of NY, they unwittingly fall in love over the internet on an anonymous chat room. I love this film due to the actor's performances, their jobs (I would love to have Meg Ryan's job) and the simple but satisfying plot. It is nostalgic due to their use of dial-up, yahoo email and old PC's - reminding me of my childhood (despite only being three when this film came out), and has aged excellently. It's an easy watch with Hanks giving his usual funny but loveable performance and Ryan being the down-to-earth girl next door character. The chemistry between the actors is undeniable and the film's plot follows naturally throughout. It isn't a cheesy film unlike many of the modern 'rom-com's (yes, Nicholas Sparks I'm talking about yours). I have seen this film countless times, and will undeniably watch it countless more. Half way through the week! Wednesday...Sleepless in Seattle (1993). Probably more notorious than You've Got Mail, Sleepless in Seattle is a comedy/drama/romance loved by many. Directed once again by Nora Ephron, it's plot consists of a young boy who calls into a radio show to help his widowed father find a new wife. Meg Ryan's character Annie Reed, hears the show and immediately is intrigued by Sam Baldwin (the little boy's father) when he comes on the air. I don't really want to say any more because it would ruin the film, but I guess you could probably figure out what happens. sweet and innocent, this film represents what 'love at first sight' is and how true love isn't just something out of a film (Annie watches An Affair to Remember and makes references to it throughout the film's duration). Although I do undeniably feel bad for Annie's fiance Walter (Bill Pullman) but yeah he is quickly forgotten about and the thought of Sam is replaced. Ok, I apologize that was a little plot spoiler...sort of...not that it is that significant. The plot of this film isn't the most complex, it is just a simple romance with two great actors who once again shine in their performances. I love this film as many others do and would recommend it to watch with a glass of wine with your girlfriends or your partner (especially if he isn't a fan of rom-coms, just for a laugh). Right...so the last day of my 'marathon' - Thursday! I couldn't unfortunately do Friday as I was out, but I ended on a big one...get it? I chose Big (1988). No doubt everyone who has seen this film, loves it. Innocent and comedic, Big is the perfect family film. After making a wish on a fun fair 'attraction' (I guess, it's hard to describe), Josh wakes up the next day to find out he is in the body of an adult. Released many years before the similar 13 Going on 30, the young boy's naivety is adorable. As the film continues, Josh realises that although scary, being an adult is also actually quite fun. After a while, however, after getting into a relationship and having a job he wishes he could be a teenager again. 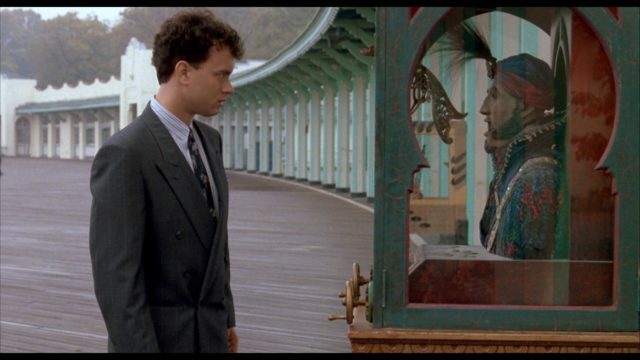 Trying to hunt down the Zoltar machine, he begs for his wish to come true. 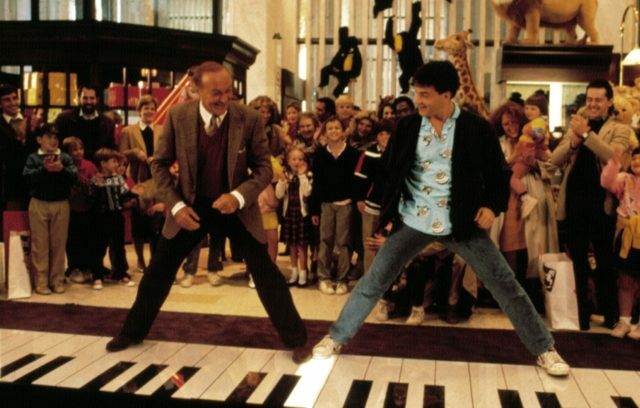 The scene of him and his boss playing chopsticks on the giant keyboard is iconic (see below) and every part of this film is filled with entertainment and heart. A true 80's classic, it was created at a time when films were unique and had substance that made them memorable, unlike many films that are now released. I have seen this film many times and yet it still makes me happy. Tom Hank's performance as Josh is funny, believable and ingenious. It perfectly displays how he is a chameleon of the acting world, as with all of his performances, he takes on the character superbly. I thoroughly enjoyed my four days of Tom Hanks films, as I love all of them and many more that Tom Hanks is the protagonist in. He is a truly brilliant actor with some equally brilliant films under his belt.